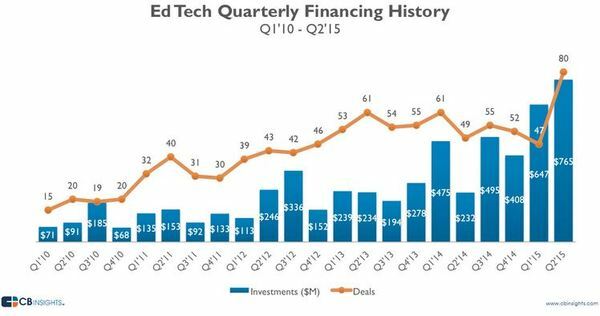 A 96 percent boom in venture financing to all education technology startups in the past year paints a rosy picture over a more nuanced K-12 ed-tech landscape. The second quarter of 2015 “set a new high-water market for ed-tech deals and financing,” with $765 million in funding across 80 deals, according to a recent blog post by CB Insights, a market research and analysis firm. But companies selling their technology primarily to K-12 in the U.S. are not the main contributors to these record-setting numbers. The biggest and most highly valued companies in ed-tech are in “open” platforms, said Matthew Wong, a research analyst who covers education for the New York-based CB Insights. That means the companies might offer one subject—like language learning—for students of any age, or they focus on providing specialized training via web-based tutorials for adults. Although CB Insights does not break out businesses that are focused on K-12 in its public analysis, they are represented in its reporting, said Wong. Companies with a larger presence in K-12 that are receiving their second and third rounds of financing “have figured out a model where they don’t have to get encumbered by tough sales cycles, especially selling into school districts,” he said. Wong cited Remind—which makes a mobile messaging app to connect parents, students, and teachers—as a business that grew organically, then raised $40 million last year. “While a company like that has risen up, there’s still the question around what will keep these platforms sustainable? I think that’s an issue that a lot of investors face,” he said. The CB Insights analysis also found that the NewSchools Venture Fund was the most active ed-tech investor between 2010 and the second quarter of 2015, making investments in more than 35 companies. Learn Capital, with investments in more than 30 companies, is the second most active company in the same timeframe. #10 – Kaltura, an open-source video company. For more news on mergers, acquisitions, and venture capital in education, follow Marketplace K-12’s “K-12 Dealmaking” series. Hello to every single one, it’s truly a pleasant for me to pay a visit this website, it consists of priceless Information. Willl yoou please drop me a e-mail? polemizowała. Z pewnością Twój blog zasługuje na szacunek. I have recently written an essay on The Rocky Mountain Venture Capital Association for mycollege. Your post helped me a lot. Thank!